The Alexapure 5-Gallon Tote gives you a durable and compact way to collect and store drinking water. Whether you’re carrying water from a source like a spring, or pouring filtered water into it, this tote won’t let you down. 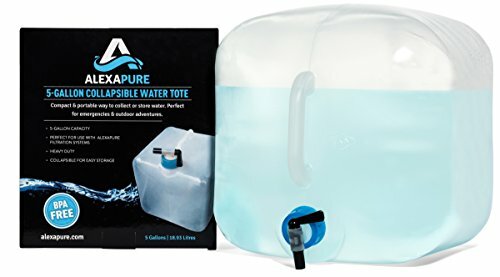 Made of rugged, BPA-free polyethylene, the Alexapure 5-gallon water tote is sure to come in handy when you need it, without worrying about punctures or dents. It’s 5-gallon capacity is enough to last one adult several days. Perfect for your emergency kit, bringing on camping trips and more. Tote includes on/off spigot that makes pouring easy. Alexapure.Passionately Innovated. Pioneered for Perfection. The Alexapure family of filtration products provide clear solutions to clean air and water-every day, world-wide or during a crisis. If you have any questions about this product by Alexapure, contact us by completing and submitting the form below. If you are looking for a specif part number, please include it with your message.